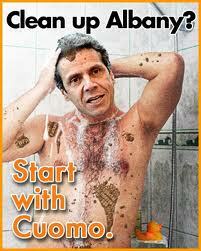 I actually thought Governor Andrew Cuomo started off admirably. For one thing, he seemed sensible toward fracking. But then the antis ramped up their campaign, and Cuomo’s fracking policy became study-it-to-death and endless weaseling. 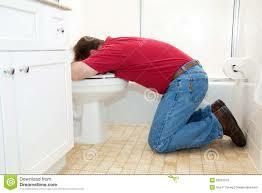 Just like Obama on Keystone, cowed by the anti-progress “progressives.” Even they must be nauseated. As to New York’s notorious gun law, I am no fan of the gun culture, but that legislation seems extreme, was rammed through with scant public consultation, and its true purpose was just to fuel Cuomo’s presidential imaginings. But the biggest disgrace, in a word: Moreland. 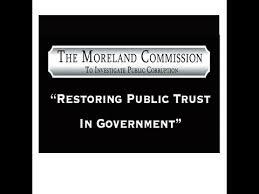 The stench of Albany corruption got so bad that Cuomo felt compelled to invoke the state’s Moreland Act, convening a blue-ribbon panel to investigate and make recommendations. The commission duly met a number of times, held hearings, and was in the midst of fulfilling its mandate — when Cuomo abruptly pulled the plug. The pretext for this breathtaking action (“It’s my commission,” he said) was that the purpose had been served, because it got the legislature to pass reform to clean up the mess. And what, exactly, did this reform consist of? A state public campaign finance law. Excellent, you might say – until told that this “reform” was applicable to precisely one elected official, for precisely one year. The official happens to be State Comptroller Thomas DiNapoli, who – coincidentally, I’m sure – happens to be in Cuomo’s dog house. And even for DiNapoli, participation in the campaign finance scheme was made optional. He promptly opted out, saying this “pilot program” was designed to fail. But this was not the first shell game Cuomo’s played with reform. Previously it was gerrymandering – at the very heart of political dysfunction. “Gerrymandering” means drawing legislative district lines for partisan advantage. It virtually eliminates electoral competition and thus legislators’ accountability to voters. Well, Cuomo swore up and down he would not accept the redistricting required after the last census, absent a reform that took redistricting out the legislature’s hands altogether. Cuomo postures not only as the Great Reformer, but also the Great Tax Cutter. Needless to say, the tax cuts are equally a sham (and New York’s business climate remains 50th out of 50 states). But the scheme will have the state send every taxpayer a rebate check. No doubt with Cuomo’s name prominently displayed. This will be in October – right before the election, when voters can show their gratitude. Excuse me while I go lose my breakfast. This uncannily echoes a recent Cuomo comment that people with right wing views – which apparently means any views different from Cuomo’s – don’t belong in New York State. (Yet again we see the tortured relationship “progressives” have with freedom of thought and expression.) 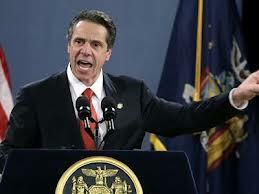 Cuomo’s remark justly elicited a barrage of condemnation. But not, apparently, enough to deter using the same tar-brush on Astorino. Never mind that there’s actually no basis for calling Astorino “right wing,” let alone “far right.” It’s simply name-calling, unashamedly cynical, based on the proposition that if you fling enough mud, some will stick. 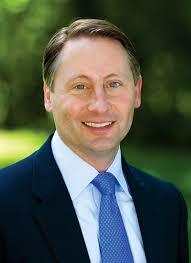 Another ad says Astorino as County Executive is “in violation of anti-discrimination laws,” all but calling him a racist bigot. The grounds for this incendiary accusation? Westchester County’s opposing federal government efforts to seize control of the county’s public housing. I think I’m going to lose my lunch now. But one final thing: somebody please inform Cuomo that loud yelling isn’t eloquence. This entry was posted on May 8, 2014 at 9:22 am and is filed under Politics. You can follow any responses to this entry through the RSS 2.0 feed. You can leave a response, or trackback from your own site. Thanks Peter, but if there were a God, she should bless all decent people and not play favorites. You’re sure I backed Cuomo in 2010? Nope. Maybe you should question other things you’re “sure” about.